Whether you double the number of sides per die or double the number of dice, you have the same total number of spots possible. But which approach helps more? Here’s a plot. 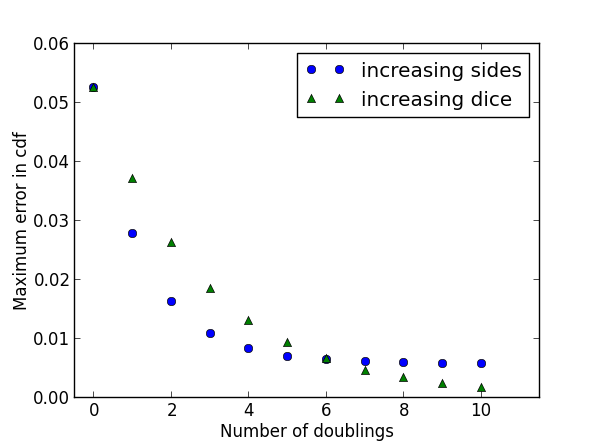 What happens if you both increase the number of sides and number of dice? Also, despite being a gamer, I’ve never seen a dice with more then 100 sides, and even then it is a pain to use. A 384 (6*64) sided die would simply be a pain to use due to the size of the sides or the size of the die. That and I’m not even sure how you would build it. Yes, I know you can very easily pick a number out of a hat, or use a computer or such, but where is the fun in that? This was really interesting. Is there a plain-language way to explain the “why” of this, or is it something that is hard to simplify much more than your (already well-done) post? Look at the extreme case. Suppose you had a die with so many faces that you effectively have a continuous random variable, say a trillion faces. A roll of such a die is still just one sample from a uniform random variable. Now consider the other extreme, one ordinary die and a trillion rolls. The central limit theorem says the total number of spots is effectively normal. Thanks, that helps with perspective.